March 5 2007 FAO released its latest State of World Fisheries and Aquaculture report (SOFIA). Total catch and aquaculture production reached a record high of about 106 million tonnes of food fish in 2004. The catches have stabilised around 85-95 million tonnes and to percentage of fully exploited fisheries remains in the area around 50%. The report includes a wide range of information on types of catches and aquaculture, continents and countries. Usually only the big picture reaches the headlines. Therefore we present some of the less highlighted information, time series of number of fishers in selected countries. The top ten fish exporters are also shown below. Number of fishers in selected countries. Source: FAO (2007). The state of world fisheries and aquaculture 2006. On December 19 2006 the NOMA Programme (Norad's Programme for Master Studies) Board made a provisional allocation of nearly 86 million NOK for bilateral and multilateral Master programmes to be established in the South. The 17 new NOMA projects include one project initiated by Ola Flaaten (picture) at the MaReMa Centre. The cooperation project will be implemented by the Norwegian College of Fishery Science and University of Fisheries in Vietnam. A new master programme in Fisheries and Aquaculture Management and Economics will be established at the Vietnamese university. More information about the new NOMA projects is found here. The Red List Programme has categorised cod (Gadus morhua) as a vulnerable species, indicating that cod is "facing a high risk of extinction in the wild in the medium-term future". Gadus morhua, of Newfoundland and Labrador. Canadian Journal of Fisheries and Aquatic Sciences 51:2126-2146. This paper is, as clearly reflected by it’s title, only referring to the Northwest Atlantic cod population. The IUCN red list criteria make use of numbers and letters referring to different population properties. In the case of cod the complete red list label is VU A1bd. This indicates that the reduction in cod population size is “based on an observed, estimated, inferred or suspected population size reduction of 50% over the last 10 years or three generations, whichever is the longer, where the causes of the reduction are: clearly reversible AND understood AND ceased, based on (and specifying) any of the following:…..(b) an index of abundance appropriate to the taxon …..(d) actual or potential levels of exploitation “. 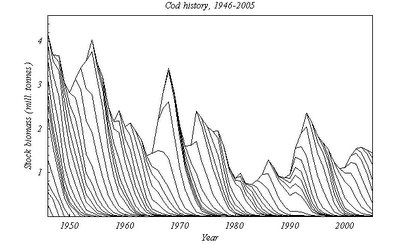 The actual history of the Northeast Atlantic cod stock is shown in the figure above. Each layer represents one yearclass. For more information, visit the web site of the ICES Arctic Fisheries Working Group.